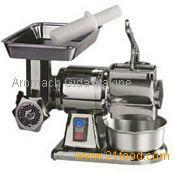 This is compact equipment and comby for Meat mincing and cheese grater. Makes 2 application in one machine. Stainless steel made. Ventilated motor for continuous duty. Hopper and mincing unit all in stainless steel. Operates with single phase. It offer 40 kg output per hour.